Dr. Barghouthi denounced these escalating violations, and said the soldiers have killed three medics, and injured dozens, since the Great Return March nonviolent processions started on the Palestinian Land Day, March 30th, 2018, and called on the International Community to hold Israel accountable for its crimes and violations of basic human rights, including its deliberate targeting of medics and journalists. It is worth mentioning that the soldiers have killed three medics identified as Razan Najjar, 22, Mousa Jaber Abu Hassanein, 36, and Abdullah al-Qutati, 20, in addition to Photojournalist Yasser Mortaja, and journalist Ahmad Abu Hussein, in the Gaza Strip, and injured dozens of journalists, since the Great Return March processions started on Palestinian Land Day, March 30th 2018. 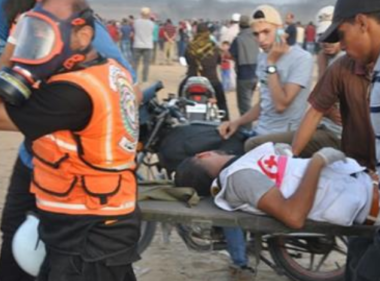 About 61% of the fatalities (180 people) and 79% the injuries (over 23,000) in the context of Gaza’s ‘Great March of Return’ demonstrations by the fence.